In the 1970s, when go-go boots are the rage, people wait in line to buy gas, and a woman might lie about her marital status to get a job with an NFL team, Connie Nicholas Carberg accomplishes the unthinkable. Taught by some of the game's greatest minds, she breaks through one of the most secretive cliques in professional sports: the all-male world of NFL scouting. Against staggering odds, she soon discovers one of the best players the New York Jets will ever dress, while learning to conquer her own insecurities away from the game. 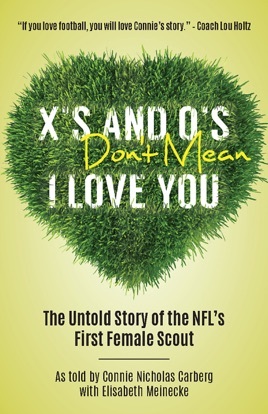 In the nonfiction “X’s and O’s Don’t Mean I Love You,” walk with Connie as she journeys from daughter of a Jets doctor to NFL scout, the first woman ever to fill that role. Encounter the football legends she befriends along the way—Joe Namath, Lou Holtz, Mark Gastineau, Woody Hayes. And meet the only man in the world who could tempt her to get married on Super Bowl weekend.